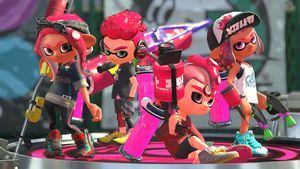 A team of Inklings and Octolings wielding a variety of weapons in Turf War. A team of Inklings wielding a variety of weapons in Salmon Run. 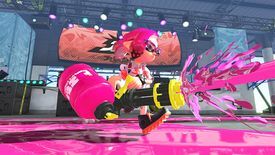 Weapons are tools used in Splatoon and Splatoon 2 to spread ink and splatter enemy Inklings. They can be purchased from Ammo Knights with cash earned from online multiplayer matches. Weapons are always in a predefined set of a main weapon, a sub weapon, and a special weapon. In Splatoon 2 new weapons have been added, and returning weapons have all new designs. Since no special weapons return from the first game, all the special weapons are changed as well. 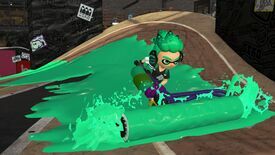 While some weapons retain the same sub weapon others have the sub weapon changed, such as the Splat Roller, which has Curling Bombs instead of Suction Bombs. Shooters are guns that fire small blobs of ink in quick succession. Most shooters will continuously fire when the player holds the trigger, but some have semi-automatic operation. Some shooters offer semi-automatic functionality, requiring the player to tap the trigger repeatedly instead of holding it for some or all aspects of operation. Spreading ink with the Splat Roller. Rollers can be pushed along the ground, leaving a trail of ink. Users can attack by flinging ink, and damage is also dealt if enemies come into contact with the weapon while it is being pushed, sometimes crushing the opponent in one hit. As of Splatoon 2, rollers can do a vertical swing. Brushes are an unofficial subclass of rollers. Brushes can be pushed especially fast, but leave a narrow trail of ink. They do not deal nearly as much contact damage, making crushing enemies virtually impossible. However, instead of flinging large waves of ink, brushes quickly swipe from side to side, flicking many smaller globs. This rapid-fire flick is their primary means of spreading ink and attacking enemies, making them ideal for fast, close-combat action. 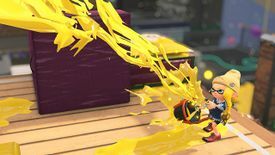 Chargers can instantly splat opponents at long range, once charged up. Uncharged shots do not have enough range or damage to be used effectively for attacking, but they can be used for covering turf. Precision aim is required, and a laser shows where the shot will land. Some chargers allow the player to store their charge when swimming around in ink. Flinging ink from a Slosher. Sloshers are single-shot, bucket-like weapons that hurl ink in an arc. The ink can be hurled over obstacles to hit opponents. Some sloshers allow the player to ink in different ways, such as hurl ink in 3 different directions simultaneously, or shoot out long-range projectiles which explode on impact with solid surfaces. A Heavy Splatling being fired. 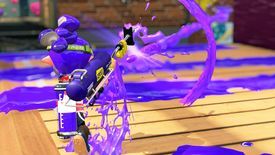 Splatlings are rotary cannons that generally have a high rate of fire and considerable range. In-game, they operate similar to chargers, but release a stream of small ink bullets instead of a single powerful one. Like chargers, a full charge is necessary to achieve the maximum potential range and firing duration. Squirting Ink with the Splat Dualies. Dualies are paired sets of pistols that give their user the ability to dodge roll. After a dodge roll, the two dualies are held together by the Inkling, enhancing their performance in various ways depending on the dualie. This weapon class was introduced in Splatoon 2. Brellas are shotguns with a deployable shield. 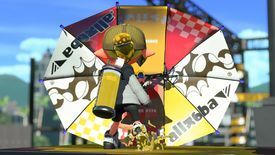 Depending on the brella model, the shield can be held in front of the user or launched forward. This weapon class was introduced in Splatoon 2. A rare weapon being loaned to a player during a rotation with randomized weapons. Rare weapons are modified weapons from existing classes. During wildcard rotations of Salmon Run, one of Mr. Grizz's personal weapons will be accidentally added to the mix. Rare weapons are tweaked versions of normal weapons with much more powerful stats. These weapons are only available at certain times and can only be used within Salmon Run and cannot be used or obtained anywhere else. The Sprinkler, Splash Wall, and Splat Bomb. Sub weapons are secondary to the main weapon. 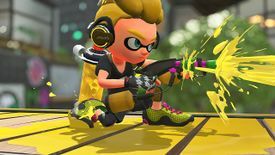 Each sub weapon has a specialized use and high ink consumption, so they cannot be used for general-purpose splatting and inking like the main weapon. There are bombs, which can be used to influence enemy movement or outright splat them. 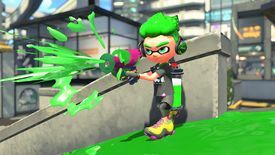 Some weapons can give special effects to opponents, like location tracking, movement penalties, and ink usage penalties. In addition to weapons that focus on enemy effects, there are sub weapons that focus on benefiting the player's team by painting the ground or adding a Super Jump point to any location on the stage. The Killer Wail, Inkzooka, and Inkstrike. Special weapons are powerful weapons that can only be used after filling up the special gauge by covering enough ground with ink. Generally, special weapons can make players invincible, allow players to track the location of opponents, damage opponents that step within a specified area of the battlefield, or grant the player a strong long-range attack. There are special weapons with highly specific effects, like allowing players to use bombs without ink restrictions, or creating explosive floating bubbles. There are a total of 91 main weapons, 10 sub weapons and 7 special weapons as of Version 2.12.0. To purchase every weapon set, a total of 834,100 is needed. There are a total of 139 main weapons, 4 rare main weapons, 13 sub weapons and 11 special weapons as of Version 4.6.1. To purchase every weapon set, a total of 1,773,300 is needed. This page was last edited on 17 April 2019, at 11:52. This page has been accessed 740,392 times.